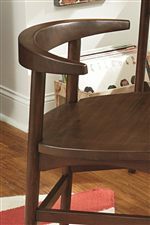 The Mila collection is inspired by modern furniture designs from early to mid-1940s post-WWII era. 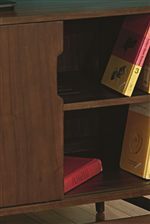 A new design that showed off clean and simple style emerged, and this retro modern look is now apparent in this collection through subtle details and woodwork. 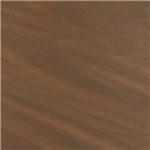 Surfboard edge profiles are used on the table tops, and elliptical shapes are a feature of the collection. No two pieces have the same ellipse, making the Mila collection incredibly unique, just like you. 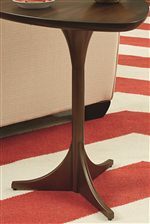 Enjoy fresh takes on traditional pieces such as the cocktail table, the TV console, and the desk. The console has a smoked glass insert that reveals a pullout organizational tray, and it can be used as a desk in smaller living spaces. 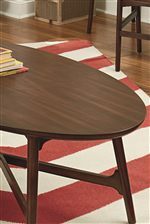 This is a dynamic collection that's crafted from walnut veneers and poplar solids. Browse other items in the Mila collection from AHFA in the area.